Agreement could bring new treatments for diseases including Parkinson’s, Alzheimer’s and Cystic Fibrosis. These assays probe novel biology, against molecular targets not previously exploited in drug discovery programs. Sharp Edge Labs, Inc., http://www.sharpedgelabs.com a drug discovery biology firm, and Creagen Biosciences Inc. http://www.creagenbio.com a medicinal chemistry firm, today announced that they have entered into a compound library screening agreement to test Creagen’s medicinal chemistry compound libraries in Sharp Edge Labs’ biological screening assays. The agreement covers all libraries in the Creagen collection and will be applied to Sharp Edge Labs screening assays across therapeutic areas, including, Parkinson’s, Alzheimer’s, Cancer, Cystic Fibrosis and Lysosomal Storage Disorders. Scott Sneddon, PhD, J.D., President and CEO of Sharp Edge Labs noted that this was a unique opportunity to bring Creagen’s compounds into Sharp Edge Labs’ trafficking assays, and to probe previously unexploited miolecular mechanisms for these diseases. The agreement is open-ended, with additional compounds being made available and additional screening assays being offered by agreement of the companies. “We’re excited to test Creagen’s compounds across a portfolio of first-in-class cellular trafficking assays using our technology’” Sneddon said. “These assays probe novel biology, and expose molecular targets not previously exploited in drug discovery programs.” Sneddon said. Prior to co-founding Sharp Edge Labs, Sneddon was part of the Drug Discovery program at Genzyme Corp., where he oversaw numerous similar compound library screening collaborations. Raj Rajur, PhD. CEO of Creagen Biosciences also highlighted the unique aspects of the collaboration. 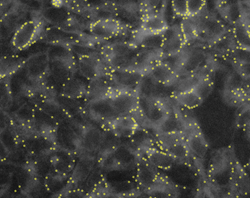 “We have assembled a screening collection that spans dozens of molecular scaffolds,” he said. “Each of these scaffolds provides a starting point for a comprehensive medicinal chemistry program, an endeavor that Creagen has significant expertise in executing,” Rajur added. Interestingly, Dr. Rajur was previously at Arqule, during the time that Arqule and Genzyme entered into a similar compound library agreement. “It was a very productive collaboration, and I’m looking forward to working again with Dr. Sneddon, as our two current companies collaborate in new drug discovery,” he said. Located in Woburn, Massachusetts, CreaGen is a privately held biotechnology company that provides medicinal chemistry and preclinical discovery services to pharmaceutical and biotechnology companies. The company also has a unique compound library synthesis platform that can produce verities of unique molecular entities for screening against various therapeutic indications. For more information on CreaGen please visit: http://www.creagenbio.com.